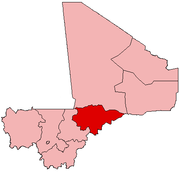 Bassirou is a commune in the Cercle of Mopti in the Mopti Region of Mali. The main village of Sampara is located 20 km north of Sévaré between the RN15 and the Niger River. In 2009 the commune had a population of 2,064. Plan de Sécurité Alimentaire Commune Rurale de Bassiro 2006-2010 (PDF) (in French), Commissariat à la Sécurité Alimentaire, République du Mali, USAID-Mali, 2006, archived from the original (PDF) on 2012-08-26, retrieved 2012-03-24 . This page was last edited on 3 November 2018, at 00:24 (UTC).